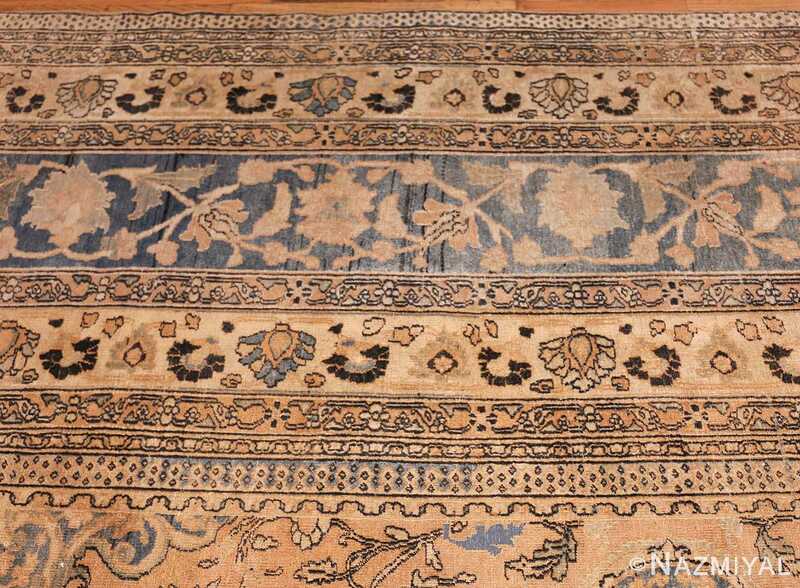 Extremely Decorative and Finely Woven Large Oversized Antique Oriental Persian Khorassan Rug, Country of Origin / Rug Type: Antique Persian Rug, Circa Date: Late 19th Century – This beautiful antique Persian Khorassan carpet features a combination and variety of intricately rendered floral patterns. 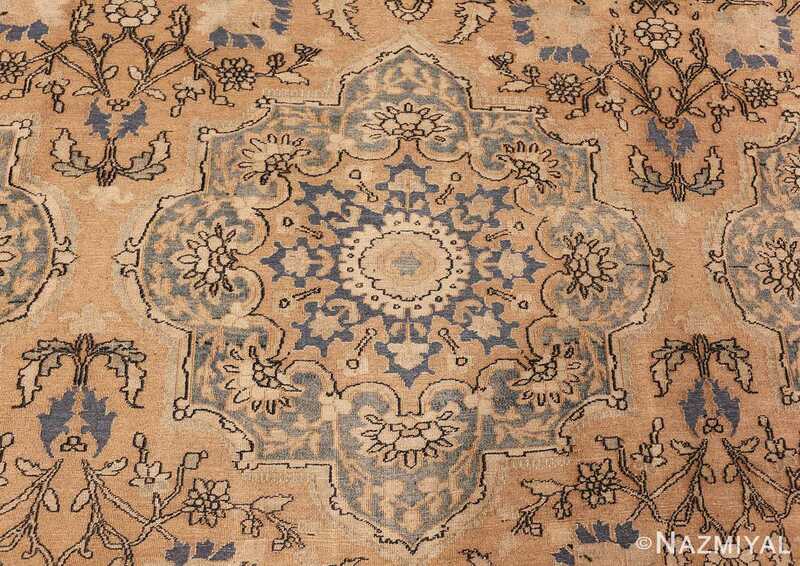 These magnificently rendered patterns boast soft colors of light blue, sea foam and taupe that are set against the neutral tan colored background. The smaller scale floral design motifs are effortlessly strewn about this extremely decorative rug. 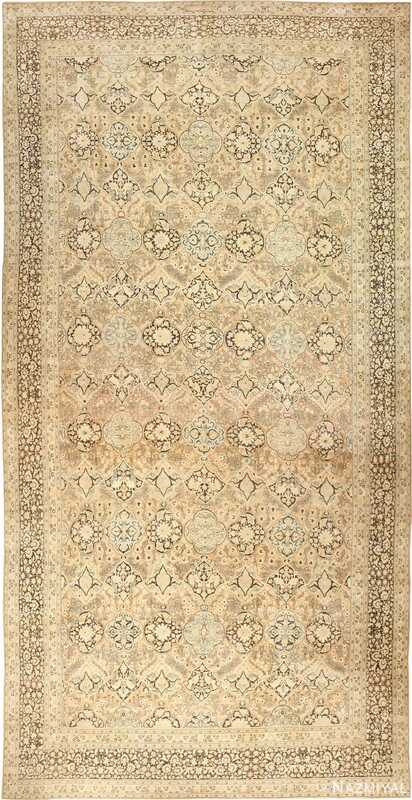 They compliment the large scale design patterns and create a feeling of vast open space. 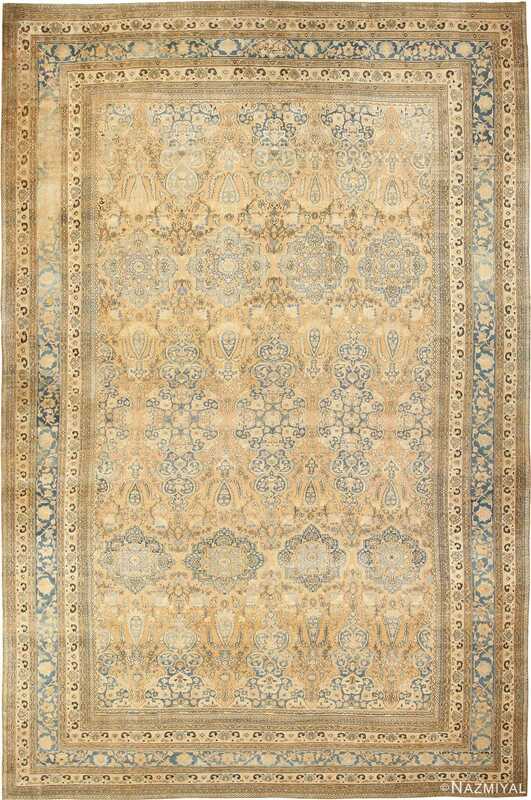 The blend of neutral earthy colors with a touch of cooler blue makes for a calming and soothing color palette. This highly sought after color palette, that is extremely versatile and easy to work with, is not one that is easy to come by in the world of antique rugs. That is why it feels like someone created this large oversized antique Oriental Persian Khorassan rug over one hundred years ago, specifically for today’s interior design trends. 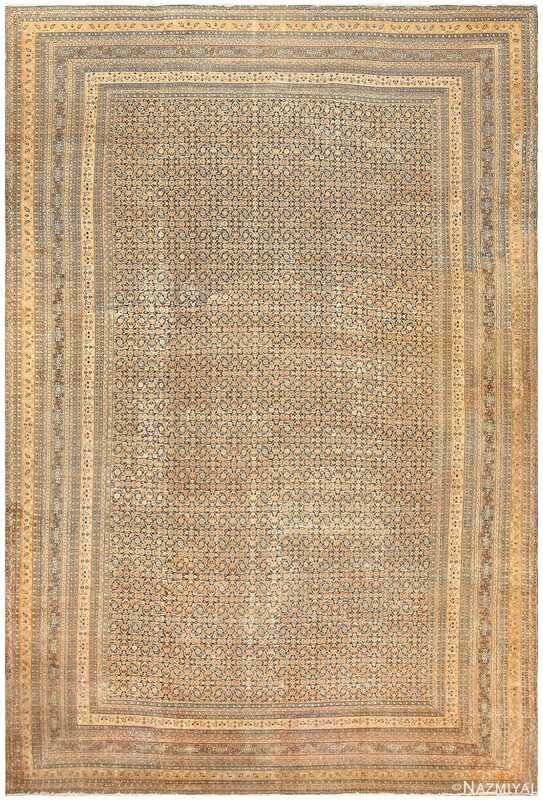 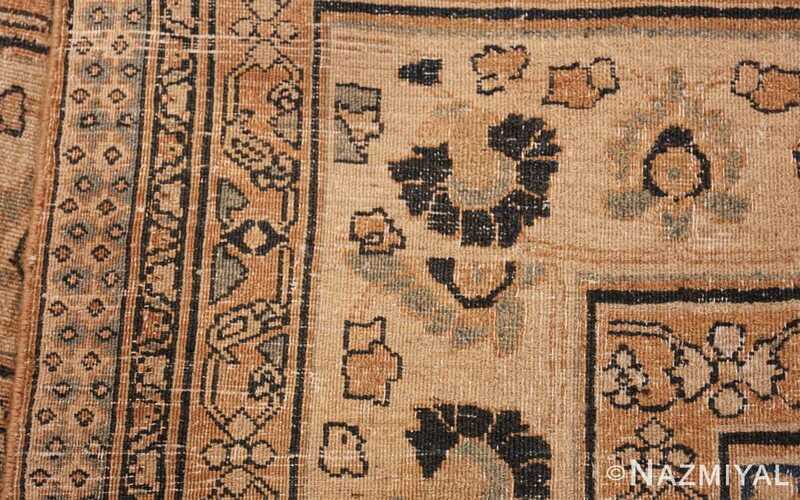 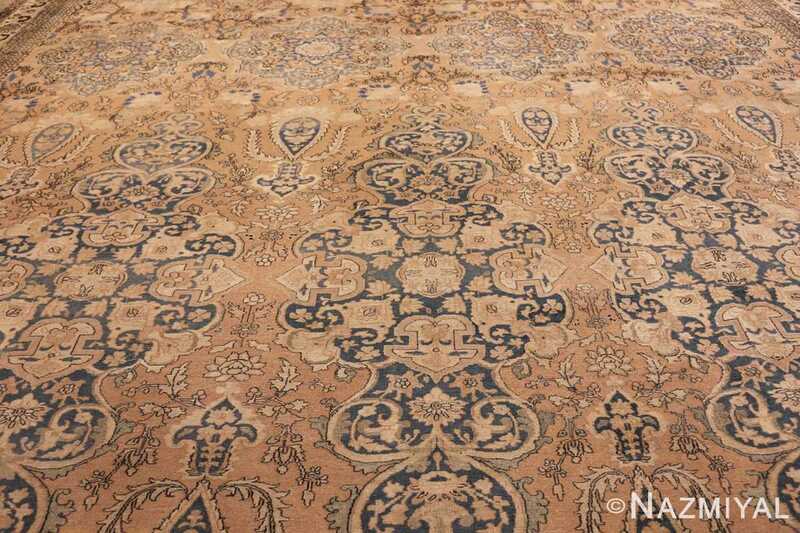 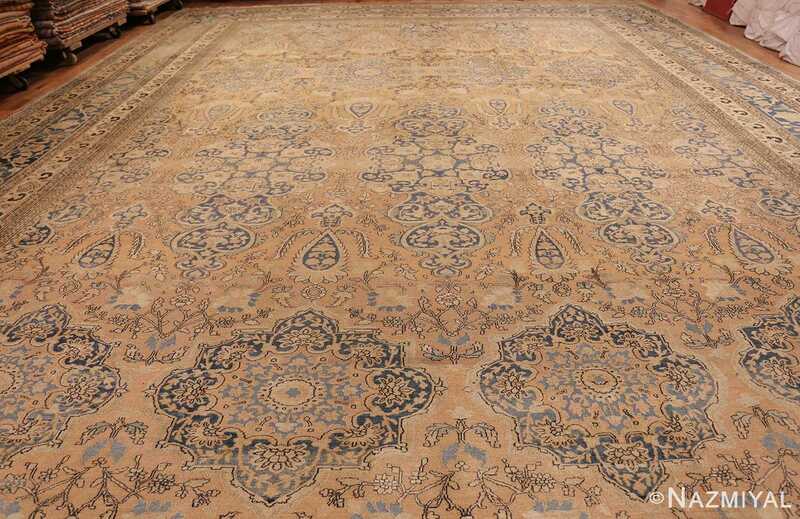 Encompassing this magnificent antique oversized carpet are many rows of delicately designed borders. 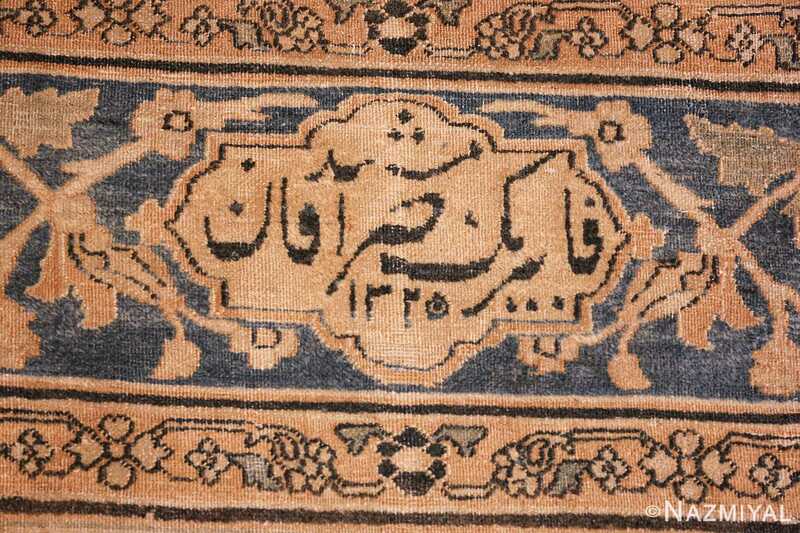 These series of borders were created in a mirrored fashion and boast the same exact colors as the field but one – the addition of the charcoal colored flowers. 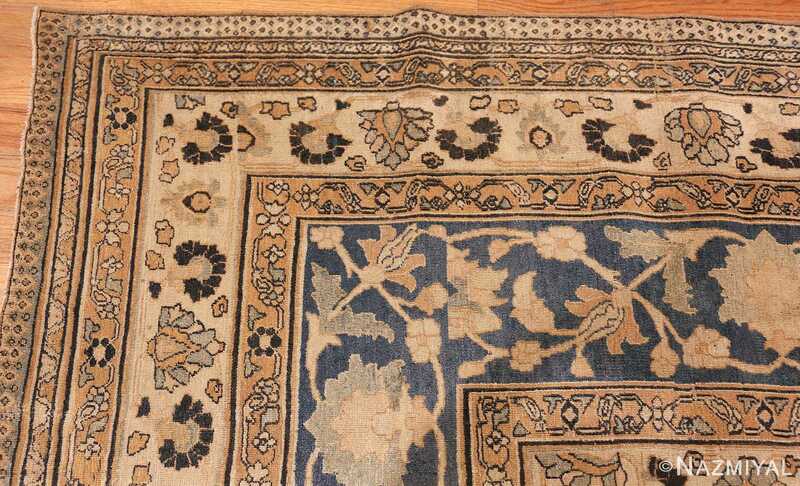 This “new” color and design plays off the the rest of the antique Oriental rug while simultaneously creating a sense of separation. As the borders change the background colors change with them, each border alternating between beige, cream, and blue. This fine antique Persian rug would make for a lovely accent piece in any room with its beautiful colors and patterns. 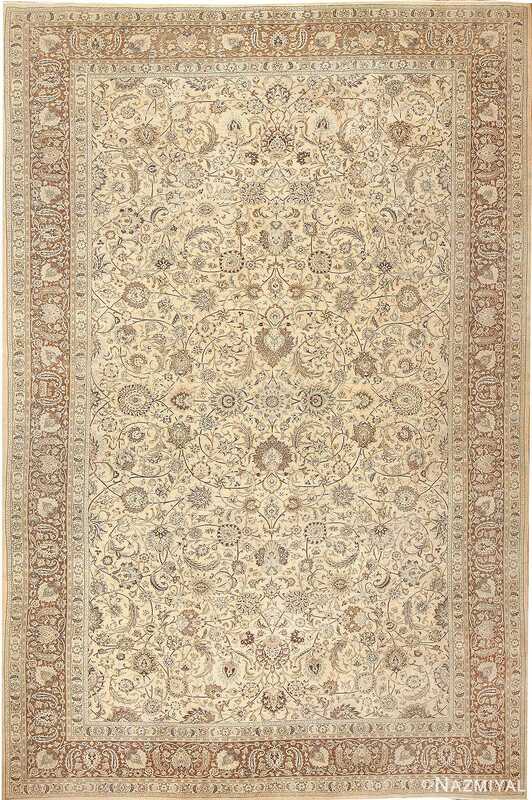 This combination of design, colors and symmetry complete the overall artistic feel and impact of this magnificent piece. 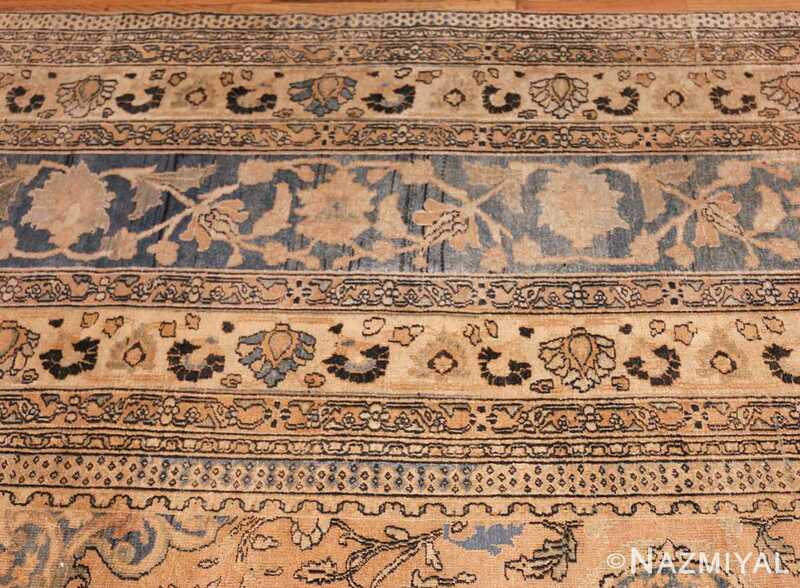 This large oversized antique Oriental Persian Khorassan rug is an interior decorators dream. 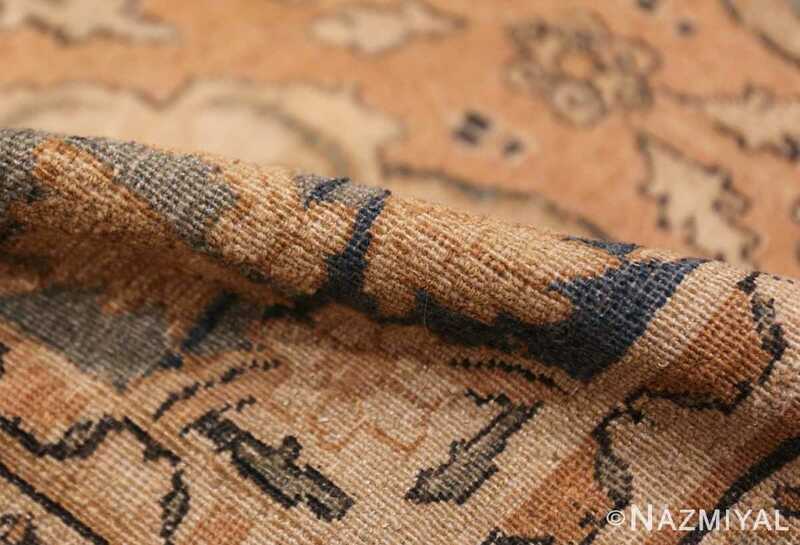 It offers the ability to combine many different style, colors and textures to your interior decor. 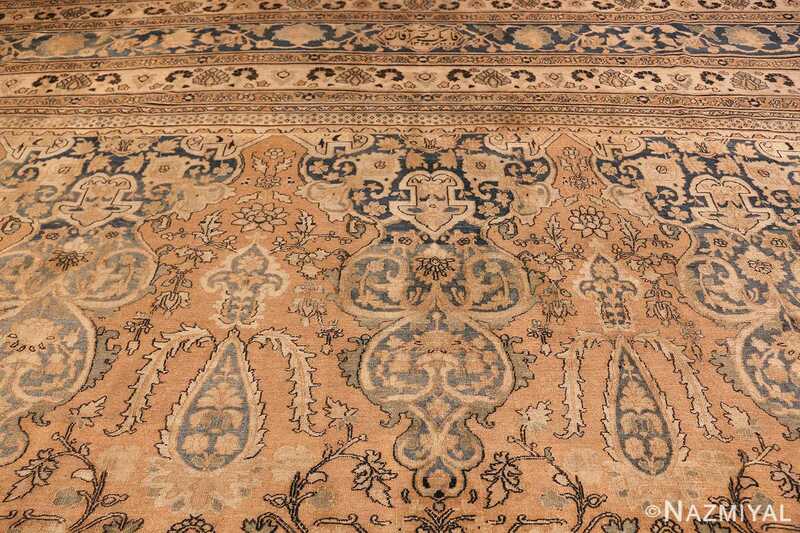 This will be a prized possession for those individuals that are fortunate enough have a room big enough to house this magnificent antique carpet.